Even though this lesson is specifically aimed at students taking the academic version of the IELTS exam, all students at an intermediate or advanced level will find the information beneficial, especially students that are interested in Business English. Occasionally you will have a diagram or a flow chart and will need to describe the stages of the process or how something works. We will explain more about this in another lesson but for now we will concentrate on describing trends. 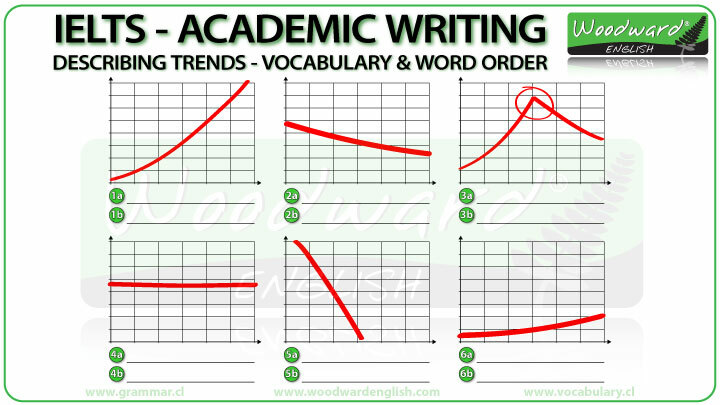 How long is IELTS Academic writing task 1? For IELTS Academic writing task 1 you must write a minimum of 150 words and you should spend 20 minutes completing this task. Remember, 150 words is the MINIMUM, not your objective. Aim for 170 words. Don’t spend more than 20 minutes on this task as you will have less time to complete the Writing Task 2 essay. 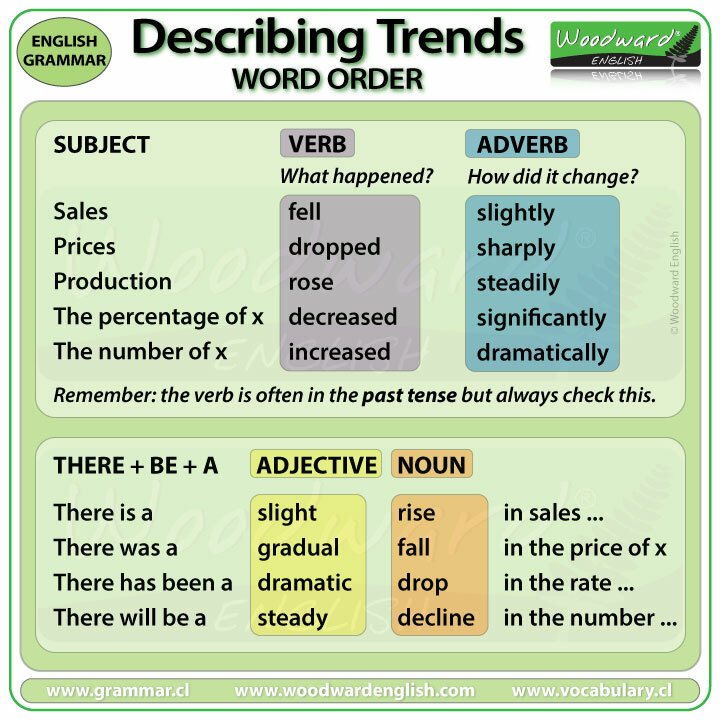 In order to do well in this section, you need to know specific vocabulary related to describing trends. We will learn this vocabulary by looking at line graphs. Line graphs are used to show trends or tendencies that happen over a period of time. A graph has an X-axis which gives us information on the horizontal axis, and a Y-axis which gives us information on the vertical axis. It is important to read what each axis is about. In this graph, the X-axis shows us the time period years, more specifically the years from 2008 to 2016. If you are not sure about how to say the year in English, see our lesson about it. The Y axis tells us the number of books sold in thousands. If you say, in 2010 … 120 books were sold. This is wrong. Why? Because 120 THOUSAND books were sold. This information appears on the Y-axis. The IELTS examiner will check to see if you have read and understood the information in the X and Y axEs. With line graphs, it is important to look at the general features or characteristics of the graph and not just repeat the numbers at each time interval. If you say… in 2008 150,000 books were sold, in 2010 120,000 books were sold, in 2012 100,000 books were sold, in 2014 (yawn… this is boring), you are just repeating what happens at each time interval. The examiner will ignore this type of response as you not explaining the GENERAL trends. What is the general trend you can see in the graph? What is another way of saying that something goes in a downward direction? We could use decline, decrease, or drop. So, how can we describe the general trend of this graph? 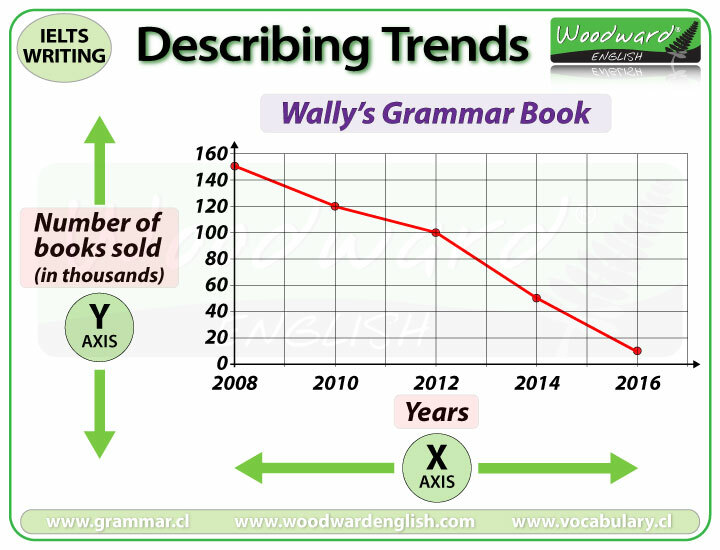 The graph shows a decline in the number of grammar books sold. Notice how we used a noun in this example …. a decline. But this information is a little incomplete. We need to add the time period. The graph shows a decline in the number of books sold between 2008 and 2016. Do you know of another way of saying this time period? The graph shows a decline in the number of grammar books sold over an eight-year period. The difference between 2008 and 2016 is eight years. Yes, it says: eight-YEAR period (without an S) and not eight-YEARS period. …. Why? Eight-year is an adjective, and adjectives never have a singular or plural form. Adjectives only have one form. The adjective RED does not change. We never say 2 REDS cars. There is no S at the end of RED because it is an adjective. Adjectives have only one form. You will also notice there is a dash or hyphen between the word EIGHT and YEAR… eight-year. This is used to combine the two words to make an adjective or more specifically a compound adjective. A compound adjective is when a hyphen is used to join two or more words together to make an adjective. Note: Sometimes native English speakers don’t put the hyphen between the two words but YOU are expected to do so for the exam. A bonus reason to use compound adjectives is that it shows the examiner you have a very good level of English. Let’s see some more examples of compound adjectives used with periods of time. For example: He works 8 hours a day. Her daughter is five months old. There was a difference of 20 seconds. The document had 7 pages. The class lasted two hours. Her daughter is five months old. … BECOMES… She has a five-month-old daughter. Notice how this compound adjective is made up of three words, yes, the “old” part needs to be there when you give an age. There was a difference of 20 seconds … There was a twenty-second difference. The document had 7 pages … It was a seven-page document. The class lasted two hours… It was a two-hour class. Let’s look at the graph again. Here are two similar statements about it. The graph shows the number of books sold has dropped. The graph shows a drop in the number of books sold. How much of a drop was it? Was it by a large amount or a small amount? With our description we don’t know so we need to add additional information. What I want you to do right now is in each statement add the word considerable OR the word considerably in its correct position? Where does each word go? The number of books sold has dropped considerably. The graph shows a considerable drop in the number of books sold. Why did we put considerably in the first sentence and considerable in the second one? Why did we put them in that position in each sentence? The word considerably is placed at the end after the verb. Why? To describe a verb, or how something happens, we use an adverb. The word order is normally verb + adverb. Drop is a verb, dropped is the past tense of that verb, and to describe how it dropped, we use the adverb considerably. Notice how the adverb comes AFTER the verb. We also know considerably is an adverb because it ends in –LY. Most adverbs, not all, end in –LY. How did it drop? … considerably. How did she walk? … slowly. How did he eat? … quickly. We are describing HOW something happens so we use an adverb. To give more information we added considerable before drop. Why? Considerable is an adjective. Adjectives describe things and they go BEFORE a noun. The word order is Adjective + Noun. Considerable, slow, and sharp all describe the trend. They are adjectives. Adjectives go before a noun. So let’s look at these two sentences again. WHY did we include these highlighted words in each sentence? We do this to give a more accurate description of the trend. You have to imagine that the examiner cannot see the graph so you need to give a detailed description by saying how things changed and by including numbers to state these changes. If I say: The price of chocolate rose. How do imagine the graph to be? Is it like Graph A or Graph B in the chart below? Yes, of course there is a HUGE difference. If you just say the price rose without saying how much it rose, that rise could be slightly (as in Graph A) or sharply (as in Graph B). They look and ARE very different. That is why you need to give a more complete, more accurate description of the graph. 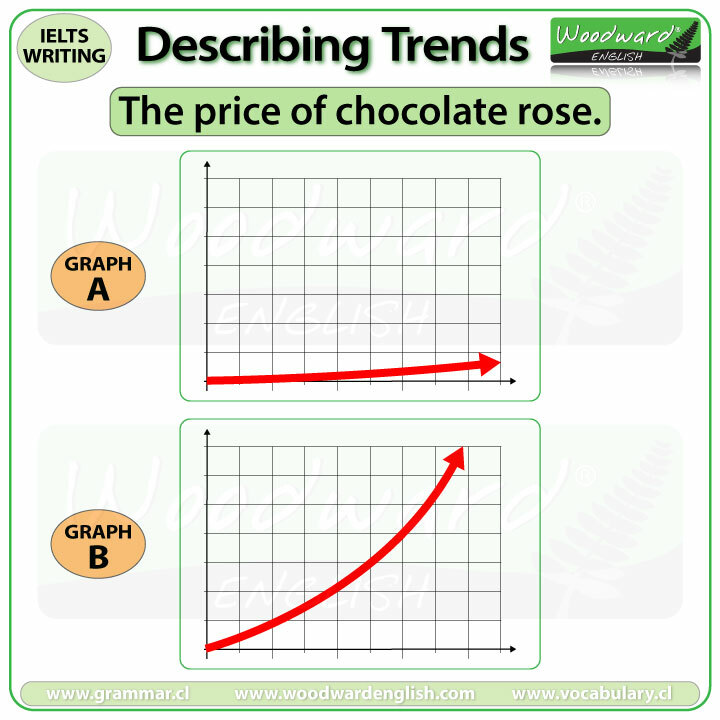 In Graph A we can see that the price of chocolate rose slightly. In Graph B we can see that the price of chocolate rose sharply. Now we need to learn more vocabulary to describe trends. Let’s start with verbs. Verbs tell us there is an action, or that something happens. What are some verbs that describe an upward trend? 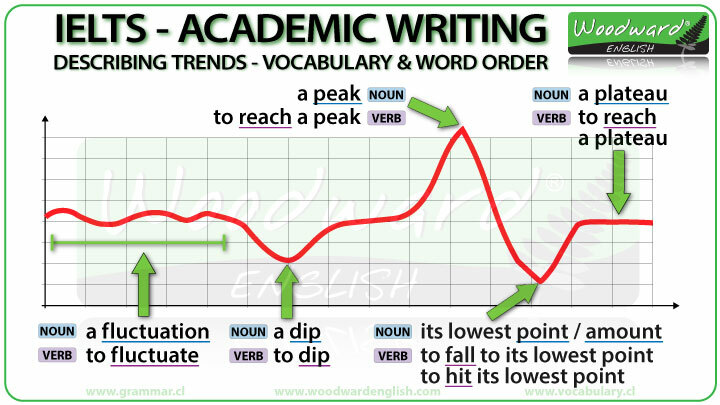 What are some verbs that describe a downward trend? Plummet and plunge both mean to suddenly decrease in a very rapid and almost straight down way. As we have seen, to give a more accurate description we can use adverbs after the verb. Adverbs describe HOW something happens. Slightly, slowly … this mean it happens at a small rate or amount. Then we have steadily, gradually, and moderately which mean that the change is at more than a small amount though not a large amount. When the change is by a large amount, we can use considerably, significantly, and substantially. When the change is by a VERY large amount, we can use rapidly, sharply, quickly or steeply. You can see that these adverbs have different degrees of strength. But sometimes the pattern or trend isn’t always UP or DOWN. Sometimes the trend remains more or less stable or the same. Here we can use the verbs stay or remain followed by constant, steady, stable, or unchanged. Yes, there is no LY at the end of these words. The number of cars in the city increased significantly between 2010 and 2015. Production rose slightly from 800 units in May to 820 units the following month. Prices of Model X dropped considerably once Model Y became available on the market. In 2017, Company profits decreased moderately as was expected. Notice the word order of VERB + ADVERB. Increased significantly, rose slightly, dropped considerably, decreased moderately. Prices remained stable during the first six months. The number of people employed at the company has remained unchanged for the last three years. Remain is used much more than the verb Stay. As we saw earlier, we don’t always use Verb + Adverb to describe a trend. Sometimes we use an adjective + a noun. There was a considerable drop in the number of books sold. Now look at how we pronounce these words. Notice how the accent is on different syllables depending on whether we are giving the noun or the verb… we will see more about this difference in another lesson. Now that we have most of the nouns, verbs, and adverbs we need, let’s see some example sentences. First are trends that contain a verb + adverb. The verb tells us… what happened?, the adverb tells us… how did it change? In the first sentence we have the subject SALES, what happened to the sales? We need a verb, FELL. How did it change? How did it fall? SLIGHTLY… which is an adverb. The percentage of X decreased significantly. The number of X increased dramatically. Notice that the verb is normally in the past tense as we are talking about trends that happened (and finished) in the past. Though of course you need to double check this. There + a form of the verb TO BE + the article before the adjective and noun. In the next example sentences, I will vary the tenses but mostly you will use the past tense. 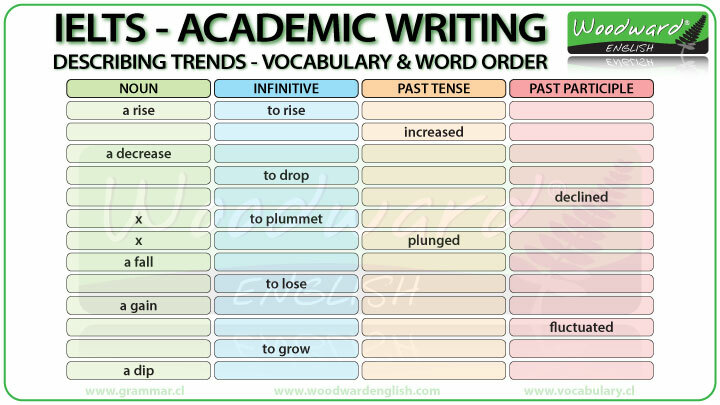 Here is a chart containing a list of words in their noun form, infinitive form, past tense form, and past participle form. Unfortunately, it is not complete. Try to complete the information in this table yourself. For example, if the noun is rise, and the infinitive is to rise, what is the past tense of rise? rose … and what is the past participle of rise? Now you complete the rest of the table. The answers appear in the video. When you learn a new word, try to learn the other forms of it, which means, see if it has a noun form or a verb form. If the word DOES have a verb form, learn what it is in past tense and its past participle form. Now you may have noticed the last word DIP… what does that mean? A dip is a momentary drop in the level of something before it returns to its normal level. The verb is to dip… we double the final P in the past tense. The verb is…. to fluctuate. For example: Prices fluctuated over that time period. We also have a peak (which is the highest point). Peak is a noun. To use it with a verb we say: reach a peak which means it goes up to arrive at its highest point. The opposite of peak is the lowest point or lowest amount. FALL to its lowest point or HIT its lowest point. Notice how we need the preposition TO after FALL but we don’t use TO after the verb HIT. a plateau … is when the trend goes up … and then remains level or stable for an amount of time. Look at the following charts. Each chart shows a different trend. Let’s look at the first one. What does the trend show? It is an increase. But if we look at chart number 6, it is also an increase. Are they different? Of course they are so we need to be more specific. In graph one we can see a SIGNIFICANT increase. Here we used a noun, or more specifically an adjective + a noun. We could say it increased significantly. Significant is an adjective which we used with the noun. Since now we have used a verb, we need its adverb form… which is significantly. 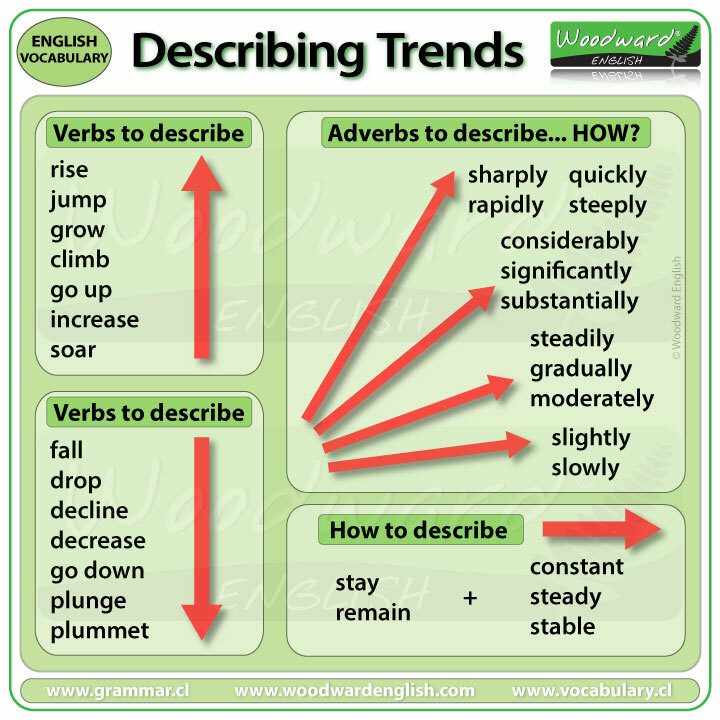 Give a description of the rest of the charts using a noun in part A and a verb in the past tense in part B. The answers appear in our video.